Courtesy Nicolle Rager Fuller, National Science Foundation. Tens of thousands suffer from abdominal aortic aneurysms every year, too often with deadly consequences. Yale scientists looked to Extreme Science and Engineering Discovery Environment (XSEDE) supercomputers to model the flow of blood through the aorta. Their work is a crucial piece to solving this disease and saving patient lives. 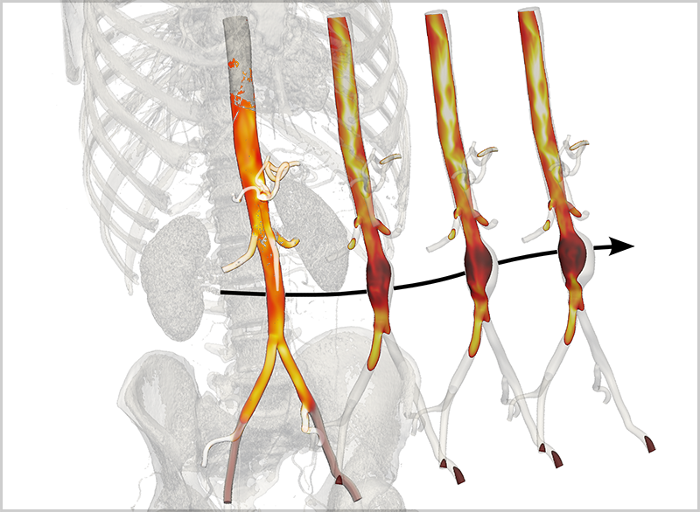 Abdominal aortic aneurysms affect tens of thousands and are often lethal when they rupture. 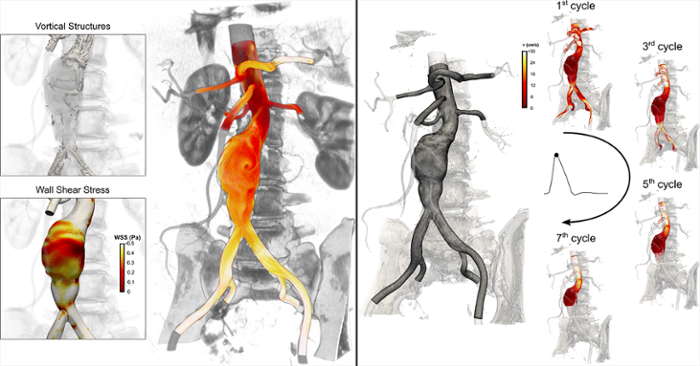 Yale university scientists employed XSEDE resources to model aortic blood flows. These models will increase our ability to track the disease and help clinicians when they treat patients. Abdominal aortic aneurysm (AAA) is a vascular disease that affects tens of thousands of people around the world each year. The disease occurs most commonly in men over 60, and is characterized by a dilation of the abdominal aortic wall and often a persistent blood clot. The aorta is the largest artery in the body; it allows oxygenated blood to be distributed to organs and tissues throughout the body. Aneurysms, or localized dilatations, can form in the ascending or descending portions of the aorta within the chest or within the descending portion in the abdomen. Abdominal aneurysms are more common — and when they rupture, they're often lethal. Because aneurysms are stressed by changing blood pressures, engineering methods developed to study the flow of viscous fluids (e.g., blood) and the failure of structures (rupture of the aorta) can be used to help understand their complex history. Once an AAA ruptures, death is nearly inevitable due to extreme internal bleeding, so it's critical to predict which aneurysms are most vulnerable. To understand why some AAAs rupture and others don't, researchers need to better understand how they form and enlarge. This requires digging deep into both the micro and macro levels to understand the complex interactions that define the disease. The Continuum Biomechanics Lab in the Department of Biomedical Engineering at Yale University, US, has set out to accomplish this task. By combining computational models with biological experiments, researchers in the lab can study AAA development at both the micro and macro scales. “The biological and mechanical complexity of AAAs demands a multidisciplinary team to advance our understanding,” emphasizes Jay Humphrey, professor of biomedical engineering at Yale. Humphrey teamed up with George Tellides, professor of surgery, and Andrew Sherman at the Yale Center for Research Computing, to enable the development of patient-specific computational models for multiple aspects of AAAs. Alongside post-doctoral fellows and PhD students, they explored factors that drive clotting in intraluminal, or interior areas of the artery, as well as the mechanobiological stability of the diseased aortas. To explore AAA hemodynamics, the fluid dynamics of blood flows, the researchers rely on a mix of computational resources from Yale and the Extreme Science and Engineering Discovery Environment (XSEDE), which is funded by the US National Science Foundation. To take full advantage of XSEDE's capabilities, Di Achille and Humphrey applied to XSEDE's Extended Collaboration and Support Service (ECSS), a program that pairs researchers with expert staff members in advanced cyberinfrastructure. The Yale researchers partnered with Yifeng Cui at the San Diego Supercomputing Center (SDSC) to adapt their code and simulations to a supercomputing environment. 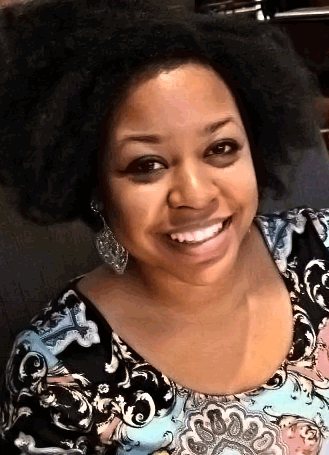 "I would say that's the biggest advantage of ECSS, talking with experts to get real insight into how our codes can be improved. It's the best way for us to optimize our codes, because we don't have time to read all the literature on these new architectures,” says Di Achille. Working with Cui, the team ran their code on Stampede, the most powerful supercomputer at the Texas Advanced Computing Center (TACC), and used its visualization nodes to create realistic depictions of AAAs. The team also used the supercomputer Trestles, which was recently transferred from SDSC to the Arkansas High Performance Computing Center. The researchers' sophisticated models allowed them to investigate another major issue in AAA — thrombus formation. 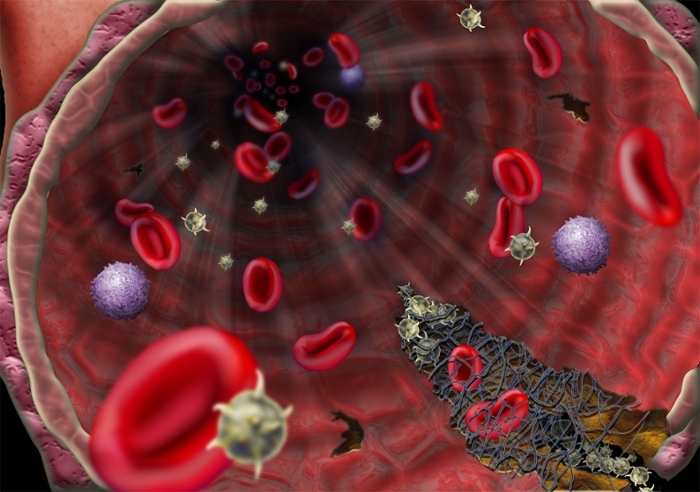 Thrombus, or blood clotting, is estimated to develop in three-fourths of all AAAs. Its presence usually indicates a more dangerous form of the disease. The group's study of how blood clots arise in AAAs, their progression, and why certain aneurysms develop them and others don't, led to a paper published in late 2014 in the Proceedings of Royal Society. Di Achille describes the group's most interesting finding as a possible explanation for the unique biomechanical factors that lead to thrombus formation. This discovery has led the team to develop more comprehensive models to track the progression of the disease. Ultimately, they hope this research will not only increase our basic understanding of AAAs, but also help clinicians make more informed decisions when treating patients.